Today's plant for #WildEdibleWednesday is one we're probably all familiar with: The genus Taraxacum, or the humble dandelion. Its common name comes from the French dent-de-leon, meaning "lion's tooth," for the deeply serrated shape of its leaves. Dandelion is probably the first plant most of us think of when anyone says “lawn weed.” But this attitude is a modern anomaly. For most of human history, dandelions were valued and celebrated, and widely planted all over the world. Members of the huge and diverse Aster family, the vast genus of Taraxacum species and subspecies are common in temperate zones worldwide, throughout the northern and southern hemispheres. Dandelions are so widespread it’s difficult to determine where they originated, but most paleobotanists agree that this plant was first semi-cultivated by humans in the ancient Near East, particularly Asia Minor (Turkey). The plant quickly became a favorite of prehistoric humans, and the seeds followed trade routes north to Europe, east to China, and west to North Africa. Like plantain, dandelion is one plant that’s benefitted tremendously from human activity. And of course, when the first European settlers came across the Atlantic, they brought dandelion seeds to plant in their herb gardens. The plant spread like wildfire across North and South America, often outrunning the settlers themselves. Like the pioneers, native tribes quickly learned to love dandelion’s many edible and medicinal uses. As a result of all these centuries of propagation efforts, dandelions are literally everywhere. They prefer open, sunny fields, such as pastures, roadsides, and of course, lawns. Any open, disturbed area that’s not swamp, desert, or deep woodland will probably play host to dandelions. This plant is relatively easy to identify. On the extremely odd chance you’ve never seen one, dandelion forms a basal rosette of leaves its first year of life, and flowers in its second year. Leaves are 3”-6” long, and have deep lobes with sharp saw-tooth tips. During its flowering year, the plant sends up a 6”-8” long hollow flower stalk topped with 1” yellow flowers, followed closely by the classic spherical fluffy seedhead that we all blew on as kids. Dandelion is technically evergreen. The photo above was taken in late November, and the plant in it was still going strong. It’s since been browsed down by deer, but it’s still there. Dandelion has no deadly mimics, but it is fairly easy to mix up with the native False Dandelion where their ranges overlap. False dandelion has longer, skinnier flower stalks with multiple flowers per stalk, instead of just one. Flowers also have notched petals (like chicory or valerian), and sometimes brown centers. The leaves are also fleshier, slightly hairy, and the lobes aren’t as deep. False dandelion isn’t dangerous (unless you’re a horse – large quantities can cause poisoning), but it does taste really bad, and isn’t quite as nutritious. Dandelion is a top-notch edible above all else. All parts of the plant can be eaten at any phase in its life cycle. The leaves make for a superb salad green, in fact, there are dandelion cultivars that are grown just for this purpose, and are coveted in high-end restaurants worldwide. They can also be used in dishes blanched, sauteed, or wilted. 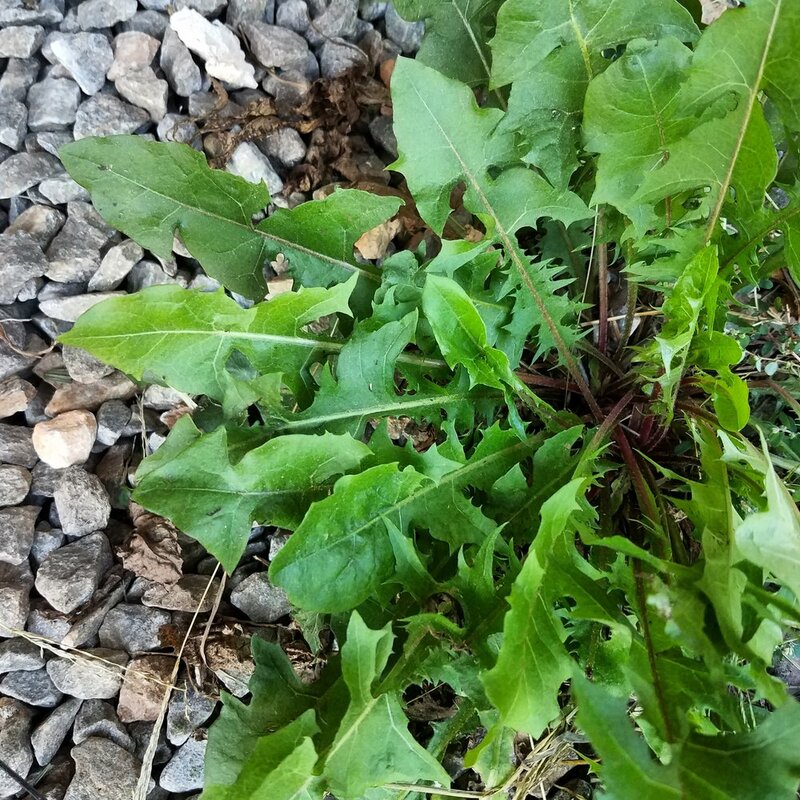 Fresh spring dandelion greens are the best for eating in salads. Like most other leafy greens, they get tough and bitter after the plant flowers. If you’re able to forage any leaves this time of year, the best play is to slow cook them like turnips or collards with bacon or a ham hock. Dandelion greens are more nutritious than spinach leaves by every metric, and have 25x the vitamin A of tomato juice. They are high in vitamin C, iron, and calcium, and have a character similar to mustard greens. The flower petals are used as an ingredient in dandelion wine. (Future wild edibles project? I think so.) Flowers can also be eaten raw in salads, or dipped in batter and fried as dandelion fritters. Like its close cousin Chicory, the root can be roasted, ground, and used as a caffeine-free coffee substitute. Dandelion contains a large number of pharmacologically active compounds. Eating dandelion unlocks many of these benefits due to its high concentrations of vitamins and trace minerals. Like many other dark leafy greens, it is rich in antioxidants such as beta carotene and polyphenols, which help reduce inflammation and dramatically curtail free radical cells, a precursor to cancer growth. Dandelion also has the potential to regulate blood sugar levels in diabetics and hypoglycemics. Chicoric and chlorogenic acid, two compounds found within dandelion, have been shown to stimulate insulin production in the pancreas while simultaneously improving glucose absorption. Dandelion has been traditionally used as a diuretic, but unlike many diuretics, does not flush potassium out of the body. That’s pretty cool if you’re trying to reduce water retention while keeping your electrolyte levels stable. The leaves help regulate digestion, acting as an appetite stimulant as well as a gentle laxative. Internally, a tea can be made from the plant to treat respiratory infections, colds, fevers, and liver issues. The ground roots were traditionally used to make a “liver tonic” for hepatic health. If you’re making a mixed herbal medicine tea, adding dandelion leaves or ground and dried roots is never a bad idea. Externally, the milky sap has been traditionally used to treat acne and warts. In fact, traditional Southern herbalists swear by dandelion sap as the most effective natural wart cure there is. The idea that dandelions are a weed is an extremely new one in human history. In America, it only began in the post-WWII years when suburbs began to plague the land. Dandelions don’t have a place in perfectly manicured lawns. Nobody really much cared before that – or more accurately, they welcomed this useful, yellow-flowered plant. To be fair, if dandelions are somewhere you don’t want them (like your vegetable garden), they are extremely difficult to get rid of. The fine, fluffy seeds (which incidentally make a great flash tinder), end up everywhere, and have a high germination rate. The taproot goes down far deeper than the height of the plant, and breaks off easily when the plant is pulled. The Chinese call it “nail-in-the-earth,” and I think this name is apt. But rather than fight dandelions, why not just use them? It’s nutritious salad greens and effective medicine, free for the taking. Know any other uses for dandelions? Which use is your favorite? Tell us in the comments!